Scrap metals collected from various sources are raw materials used in metal recycling. Scrap metals are separated and processed several times to yield recycled metals. Scrap metals are primarily collected from discarded automotive components, construction materials, electronic devices, electrical goods, etc. Major companies operating in the recycled metal market procure scrap metals from scrap collecting companies, brokers, dealers, industrial manufacturers, municipal organizations, individuals, etc. Ferrous, non-ferrous, and precious metals are key product types of the global recycled metal market. Ferrous metals include iron and steel. Non-ferrous metals product segment includes metals such as aluminum, copper, zinc, nickel, and lead. Precious metals such as gold, silver, and palladium are also recycled. Metals produced through recycling are widely used in numerous industries such as automotive, building & construction, shipbuilding, electrical & electronics, home appliances, and industrial machinery. Rise in awareness about conservation of energy and natural resources across the world plays a key role in encouraging manufacturers to recycle metals. Furthermore, secondary production of metals through recycled metal is less expensive owing to energy efficiency of the process. Thus, economic advantages of recycled metals is boosting the demand for these metals. Steel is one of the most recycled metals. Ferrous metals (iron and steel) are used extensively in various industries such as automobiles, appliances, construction, and packaging. Ferrous metals are metals with iron and magnetic properties. Iron and steel scrap are some of the widely recycled metals in the world. This scrap comes from end-of-life products and fragments generated through manufacturing processes. Scrap, which is used in steel production, plays an important role in the steelmaking industry. Around 40% of iron and steel products are manufactured from the scrap of ferrous metals. Aluminum is one of the highly recycled materials after steel. Almost 630 million tons of recycled steel was produced in 2017. Aluminum, copper, lead, zinc, nickel, titanium, cobalt, and chromium are the commonly used non-ferrous metals. Large amount of non-ferrous scrap is recovered every year. This scrap is used by refiners, smelters, foundries, and ingot makers. Among non-ferrous metals, copper and other metals such as tin and nickel are expected to provide higher growth opportunities in terms of revenue. In terms of volume, copper and aluminum are majorly recycled metals across the world, with mature market conditions being observed in the U.S., Japan, and Western Europe. Precious metals such as gold, silver, platinum, and palladium are the other metals that are recycled. Precious metals are recycled in lower amounts, as they are costlier compared to ferrous and non-ferrous metals. Extraction of these metals from the earth’s crust entails high expenditure, as these are rare metals. However, currently, low amount of precious metals are being recycled due to factors such as low recycling of precious metals such as gold and platinum-group metals, complexities in the recycling process, and high costs required for recycling of these metals. Recycled metal can be utilized in industries such as building & construction, automotive, shipbuilding, electrical & electronics, industrial machinery, household appliances, packaging, and power transmission. Demand for recycled metal is increasing primarily due to the rise in demand in building & construction, industrial machinery, and shipbuilding industries. The number of regulations on the usage of recycled metal in these industries is lower than that in automotive and electrical & electronics industries. However, metal can be recycled without altering its properties. This facilitates its consumption in large number of applications. Automotive is anticipated to be a highly lucrative application segment of the recycled metal market during the forecast period. The industry is estimated to experience an unprecedented growth rate in the next few years. Usage of recycled metal in the automotive industry is estimated to rise significantly owing to the low cost and low energy involved in the production of secondary metals. 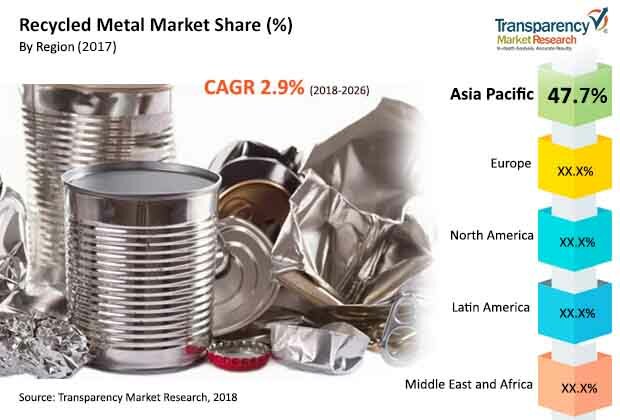 Growth in building & construction (especially new construction) and electrical & electronics industries in Asia Pacific, particularly in China, India, Japan, South Korea, Taiwan, Singapore, and Vietnam, is projected to provide lucrative opportunities to the recycled metal market. Expansion in building & construction, automotive, and industrial machinery industries in North America and Europe is also likely to offer lucrative opportunities to the recycled metal market. The nature of products being considered for recycled metals plays an important role in the recycled metal market. The metal scrap stock that is used for recycled metal needs to undergo several processing steps. Therefore, selection and collection of scrap is a major challenge faced by the recycled metal industry. Lack of stringent rules and regulations to organize the flow of waste is hampering the recycled metal market in developing countries. Lack of consumer awareness about recycling of products obstructs the scrap collection process. A negligible percentage of discarded electronic goods and household appliances is directed to scrap collectors in developing countries. Lack of policies to direct the end-of-life goods to scrap collectors is anticipated to be a major restraining factor of the recycled metal market during the forecast period. Furthermore, issues such as metal theft and lack of consumer awareness are anticipated to adversely impact the global recycled metal market in the next few years. The comparatively inferior quality and purity of secondary metals obtained from recycling is also likely to hamper the demand for recycled metals during the forecast period.